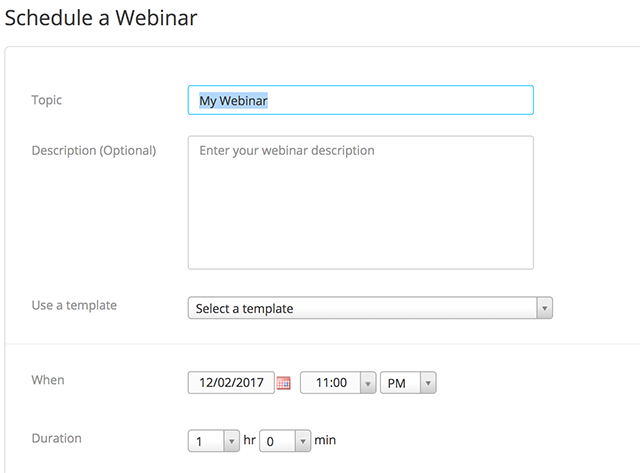 Scheduling a Webinar with registration requires your registrants to complete a brief form before receiving the link to join your webinar. This allows you to collect the names, email addresses, and other information from the registrants. 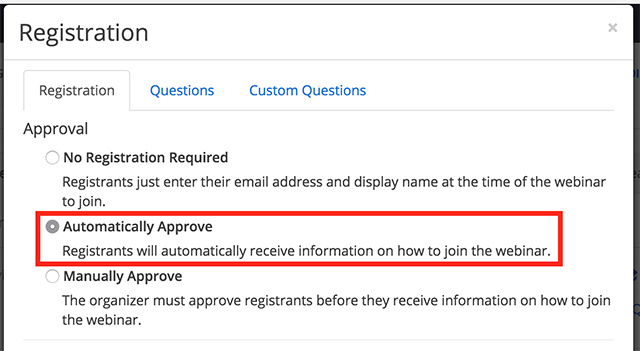 You can choose to automatically approve anyone who registers or manually approve attendees. If you do not need to collect registrant information, you can schedule a registrationless webinar. Registration: Check this to require registration. Attendees register once and can attend any of the occurrences: Registrants can attend all of the occurrences. All dates and times of the webinar will be listed and the registrant will be registered for all occurrences. Attendees need to register for each occurrence to attend: Registrants need to register separately for each occurrence to attend. They can only choose one date and time on the registrant page. Attendees register once and can choose one or more occurrences to attend: Registrants register once and can choose one or more occurrences to attend. They will need to select which dates and times they would like to attend and they will only be registered for those occurrences. They can choose multiple options. Require Webinar Password: You can select and input your webinar password here. Joining participants will be required to input this before joining your webinar if joining the webinar manually. It will be included in the registration confirmation email and if they join by clicking the link in this email, they will not need to enter the password. Make the webinar on-demand: This will automatically record the webinar in the cloud and share a link with all registrants. Learn more. Your webinar is now scheduled. Scroll down to the bottom of the webinar details page to view the registration options under Invite Attendees. Next to Approval, it will list Automatically Approve or Manually Approve. If it lists Manually Approve, click Edit on the right side. You can copy the registration URL or the invitation to share with your attendees. Next to Approval, it will list Automatically Approve or Manually Approve. If it lists Automatically Approve, click Edit on the right side. After an attendee has registered, return to your Webinars page. Click on the name of the webinar to view the details. Select Edit to the right of Manage Attendees. Select the user(s) to approve or deny. 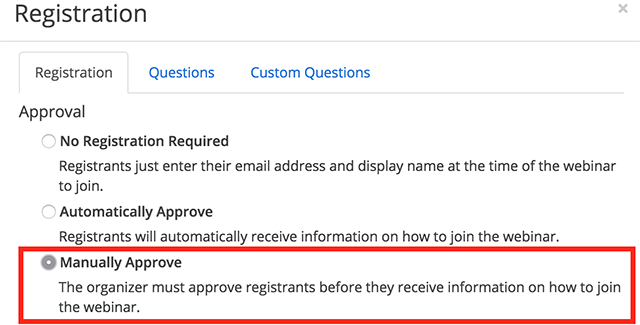 You can select multiple registrants to approve or deny at the same time. If approved, they will receive an email with information on how to join the Webinar.